Image: oxygen, carolshiva/Getty Images. Design: Kenzie Mastroe/SheKnows. For most of us, coffee is life. And while any coffee will do in a pinch, there’s something magical about starting every day with a truly great cup of the stuff. Because $5 pour-overs from your local hipster coffee shop can really add up, it pays to learn how to make a truly great cup of coffee at home. While great coffee is fairly easy to master, it does require investing in some hardware and sourcing great coffee beans. Whether you’re a seasoned coffee pro or an amateur looking to up your game, here are 17 ways to elevate your morning cup of joe. Coffee beans start to oxidize as soon as they’re ground, which means they lose a ton of flavor as they sit on the shelf. Never heard of it? “Coffee trees thrive along the ‘Bean Belt,’ which is the zone between 25° north and 30° south along the equator,” according to the coffee site Roasty. Specifically, they recommend buying coffee grown in Hawaii, Colombia, Brazil, Kenya, Ethiopia or Indonesia. After coffee beans are harvested, they get shipped somewhere else and roasted. The type of roast — light, medium, dark, etc. — can make a difference to the flavor, as can who the roaster is. Find a local coffee roaster you like, and stick with them. The optimal shelf life for roasted coffee beans is a week or less, so make a point to buy new beans every week, and choose beans that were roasted within the last day or two. You can find the roast date on the packaging. Even whole coffee beans will oxidize when exposed to too much air. Buy beans in sealed containers — steer clear of bulk bins because of oxidation and because you don’t know how long they’ve been sitting there — and use that same container for storage. Keep them in a cool, dry place. Now that your bean situation is sorted, you need to think about how to grind them. Wirecutter tested the most popular grinders and deemed the Baratza Encore conical burr coffee grinder ($138.99 at Amazon) to be the best. If that’s a little out of your budget, the Capresso Infinity conical burr grinder ($90.59 at Amazon) is another solid option. Grind your beans fresh every morning, and only as many as you plan to brew right away. Yes, there’s such a thing as too-strong coffee. Invest in a digital scale — I love the Ozeri Touch professional digital kitchen scale ($13.49 at Amazon) for coffee, baking and any other kitchen measuring tasks that come up — then use this chart to figure out the perfect coffee-to-water ratios. Maybe this is taking things a little too far, but for days when you want the absolute best cup of coffee, start with bottled spring water instead of tap. Black Bear Coffee writes that spring water is best and notes that if you go with tap water, make sure you filter it using a clean, odorless container. Every serious coffee snob knows Keurigs and drip coffee pots just don’t cut it. With a French press, you heat water, then pour it over grounds in the press, let everything steep, then push down a plunger to separate the grounds from the liquid. It’s a relatively low-maintenance process and will give you seriously rich, flavorful coffee. Wirecutter put popular French presses to the test, and the winner is wonderfully affordable: the Bodum Chambord French press coffee maker ($20.99 at Walmart). For pour-over coffee, you heat water and pour it over coffee grounds in a filter that sits right above your cup. It’s similar to the French press method, but your grounds end up fully separated from the final coffee, instead of sitting at the bottom of the container. As a result, the coffee likely isn’t as strong. Wirecutter recommends the Kalita black coffee dripper ($23 at Amazon) as your best pour-over option, but a classic Chemex ($37 at Amazon) is also a great bet and makes for a prettier kitchen decoration. This is the optimal coffee-brewing temperature according to Black Bear Coffee and will ensure you get as much flavor as possible without burning the beans. The process of making espresso is different and calls for pushing a small amount of almost-boiling water (just below 212 degrees F) under pressure through very finely ground coffee. Because this pressure is important, you need a legit espresso machine to make legit espresso. The Breville Barista Express espresso machine ($581 at Amazon) is the absolute best one around, according to Business Insider. It comes with a grinder (which is important because grinds for espresso are finer than those for regular coffee), a milk frother and frothing pitcher (for lattes!) and a few other cool features. If you don’t have $600 to drop, the De’Longhi bar-pump espresso and cappuccino maker ($55 at Amazon) is still a good bet, but you’ll need to buy your own espresso grinder. Adding cinnamon or vanilla directly to brewed coffee can be too overpowering, but mixing a little bit of ground cinnamon or freshly scraped vanilla bean into your coffee grounds will add just a hint of flavor. Your coffee won’t really taste like cinnamon or vanilla, it’ll just be a little bit richer. Vanilla and cinnamon will blend right into your coffee, but stronger spices like cardamom or nutmeg will add discernible flavor. If that’s what you’re going for, grate a bit of nutmeg or crack open a cardamom pod, then mix that into your grounds before brewing. A few flakes of sea salt mixed in with your grinds won’t make your coffee salty but will intensify the flavors that are already there. Coffee purists swear by black coffee, but some of us prefer the stuff with a little bit of milk. 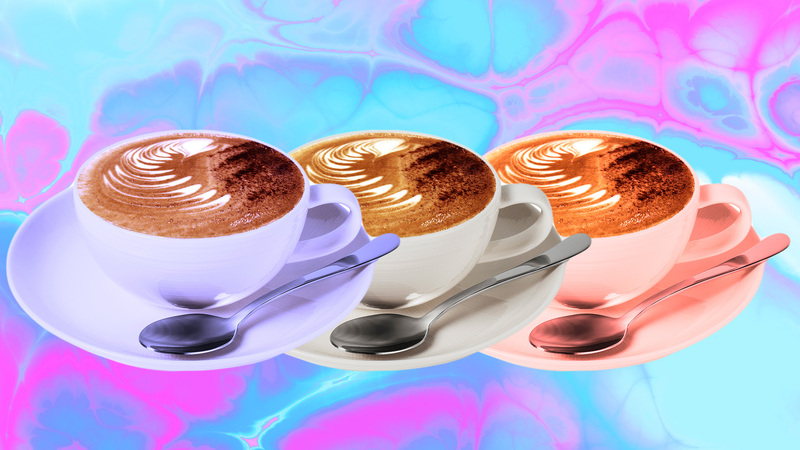 If milky coffee is your thing, invest in a cheap milk frother, and you can have DIY lattes or cappuccinos every morning. The Bodum Schiuma milk frother ($6 at Target) is inexpensive and easy to store in a drawer. Heat your milk to a simmer on the stove or in the microwave before you steam it, then pour it right into your coffee. For best results, go with whole milk. Soy milk has a distinct flavor, while almond milk is thin and doesn’t really froth without a ton of added fillers. Oat milk, on the other hand, is thicker and creamier. Oatly Oat Drink Barista Edition is made to foam just like milk too! Look for it in your local grocery store. To make cold brew at home, grind your beans as coarsely as your grinder allows. In a sealable jar or container, mix 8 ounces of grounds with eight cups of filtered or bottled spring water (that’s far more grounds than you’d use for regular coffee, BTW). Let it sit for at least 18 and no more than 24 hours, then strain it through a cheesecloth inside a strainer. Store the brew in an airtight container in the fridge, and drink it within three days.